There has been a tonne of buzz surrounding Sleek’s Pout Paints so of course I had to try it out. It’s described as a heavily pigmented lip colour that can be mixed to create your own unique colour. But does it live up to the hype? The shades I tried were milkshake, peachy keen and Rosette. The first thing I noticed was that the contents felt crunchy inside the tube but as soon as you open the tube that dissipates and the tube then feels soft and fluid inside. How odd! Here’s some swatches of the three shades. The one thing I noticed while applying them is how time consuming it is, due to the heavy pigmentation . It’s very pigmented so the look won’t be for everyone as it’s very bright and in your face definitely not one for shrinking violets. It’s also not at all transfer proof. My coffee cup was left with a bright lip print on it and I wouldn’t go near your boyfriend while wearing it or he’ll be left looking like a clown. It mixes really well though so it’s perfect for creating your own shade and it comes in loads of different colours. It lasted well though – four hours in and my lips were almost as vivid as they were when I applied it despite the transfer onto my coffee mug. I love bright pigmented lippies so I am a fan of this product but as I said before it’s not for everyone. I’m dark skinned so this product is one of the few lip products that actually standout on me and I usually find that many lip products aren’t pigmented enough against my dark skin. My favourite of the bunch was definitely Rosette. It’s a lovely bright fuschia and was by far the easiest to apply evenly. I’m really keen to try the other colours in the collection and to experiment more with mixing shades. For those less adventurous there is a white shade that can be mixed with the others to lighten up the colour. So has anyone else tried the pout paints? What did you think? 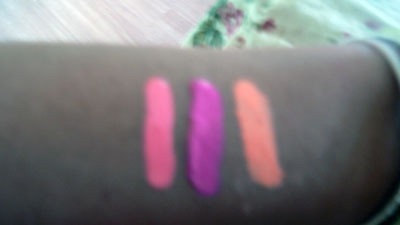 I loved these colours, especially the name "peachy keen" I'm into pink lippies very much. The last one (Rosette) looks so pretty on you. I'm suuuuper into pink lips right now too!! I love that you can mix your own shade, but I have very drying lips...how are they w/ moisturizing?